Nickel-plated steel. Assorted sizes 3, 5, 7. 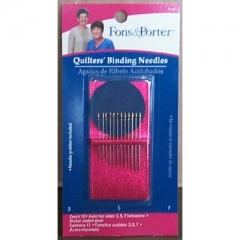 These betweens are excellent for sewing through thick layers of French-Fold (doubled) binding, quilt top and edge of batting. Short, stout and non-bending needle. Size #3 for heavy fabrics such as flannel or denim. Needle grabber included.